Hello!! 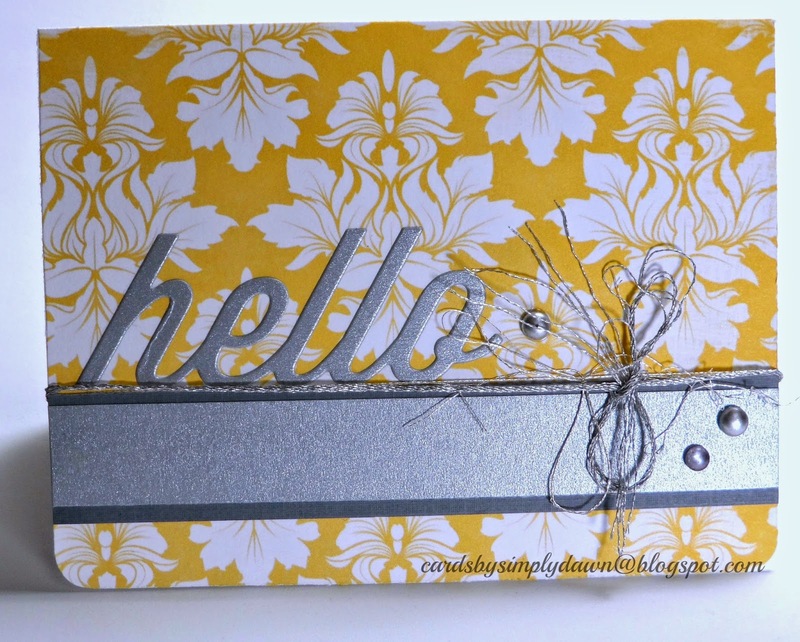 It's been a few days since I posted a card and I wanted to share this happy hello card that was one of the cards that we made in my card class this month. We have had a long winter here in Virginia and this yellow and white damask just screams spring to me. I paired it with some pretty silver shimmer paper, gray paper and some fun silver embroidery thread that was fun to fray! I added the hello die cut from Papertey Ink and a few dew drops and that was it! Fun, happy, done!! Sorry the lighting on this one is horrible!! It is much prettier and springier, (is that even a word, lol?) in real life! I hope spring has sprung where you live! Tomorrow we are supposed to get more of the same! It makes me happy! Enjoy the rest of your weekend and I hope to be back soon with another card. I have a bunch made, I just need to take photos and edit them.